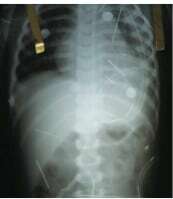 Medical doctors in Brazil remain baffled as to how metal sewing needles were placed inside the body of another two-year old boy from Brazil, with zero evidence of digestion and no signs of an entry wound on the outside of his body. El Sheikh Syed Mubarik Ali Shah Gilani, founder of the El Gilani Methodology (EGM), an innovative method of spiritual therapy and healing, said the rising cases all over the world are a clear sign of the practicing of occultism. “These needles were not swallowed. This is black magic and has become common now in villages of India, Columbia and Brazil”, says El Sheikh Gilani. Brazilian hospital director, Dr. Luiz Cesar Soltoski is treating the young boy, “We think it could have only been by penetration because we found needles in the lung, the left leg and in different parts of the thorax. It couldn’t have been by ingestion.” On the contrary, the same group of doctors verified the fact that there were no signs of exterior entry. Although baffling, the findings are consistent with reports that the boy’s step-father confessed to practicing Black Magic. This rising practice has been documented by the Pakistan Institute of Medical Science where doctors and professors reported a case of seven family members from the Tharparkar district, who give an account of metal needles penetrating their body for years. Decades ago, El Sheikh Gilani pioneered the El Gilani Methodology, a methodically researched treatment proven to cure “incurable” mental and physical diseases by using select portions of the Holy Qur’an and prayers of the Holy Messengers of the One Almighty Creator. El Sheikh Gilani offers hope to victims, “We know the causes and we know the remedy. This is a warning that world is entering into a new era and will pay for evil and black magic causing human suffering and great loss; an evil injustice.” He asserts that doctors practicing traditional medicine and psychiatry, the Darwin and Freudist systems, do not understand the causes and therefore can never offer a remedy. El Sheikh Gilani urges victims to contact the Abdul Qadir Gilani Institute of Sufic Sciences for more information at SuficSciences@aol.com.